Two week ago my parents went to this Indian Grocery along UN Avenue in Manila and bought a lot dried herbs, spices, lentils, curry mixes, tandoori mixes, fiery dried peppers and all things Indian. When they arrived from their trip, I placed everything in a huge utility box where they stayed waiting to be opened. Three days ago my dad opened his loot and made a delicious, super spicy fish curry for dinner which I immensely enjoyed with a generous serving of hot jasmine rice and a dollop of mango chutney on the side. 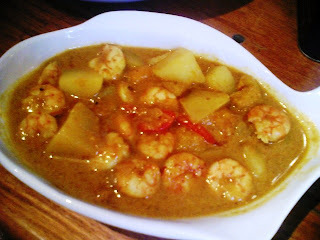 Inspired by my dad's delicious curry dish, I decided to make my very first curry dish using shrimps fresh from the market. And since we ran out of mango chutney, I decided to add ripe mangoes to the dish instead. I guess you can say that I was "curried" away. Remove shrimp heads, tails and shell and devein. Place shrimps in a bowl of water and add salt. Set aside. Remember to wash the shrimps in running water before using to remove excess salt. Dissolve curry mix and turmeric in about 1/4 cup of hot water. Set aside. In a pan, saute onions and ginger. Add chicken stock, coconut milk and the curry-turmeric mixture. Let it simmer a bit before adding the potatoes and squash. Simmer until tender, about 10 to 15 minutes. 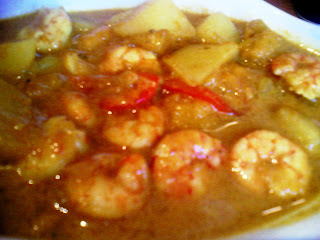 When the potatoes and squash are fork tender, add the bellpepper shrimps and mango. Simmer until the shrimps are cooked. Season with salt and pepper. Serve with rice and mango chutney, if desired.